I can’t believe we’re already 5 days into our trip. 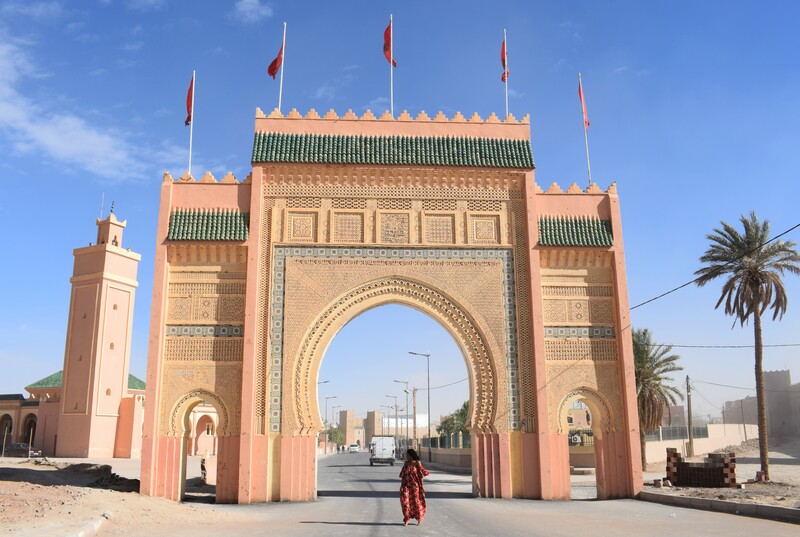 We spent the past four days in Marrakech and on the road to Aït Benhaddou. Marrakech, the city, was almost exactly how I had imagined it would be. My experience in it was was better though. Aït Benhaddou, on the other hand, I didn’t consider so much. But like I mentioned in this post, I loved this place. I loved the hotel we stayed at. 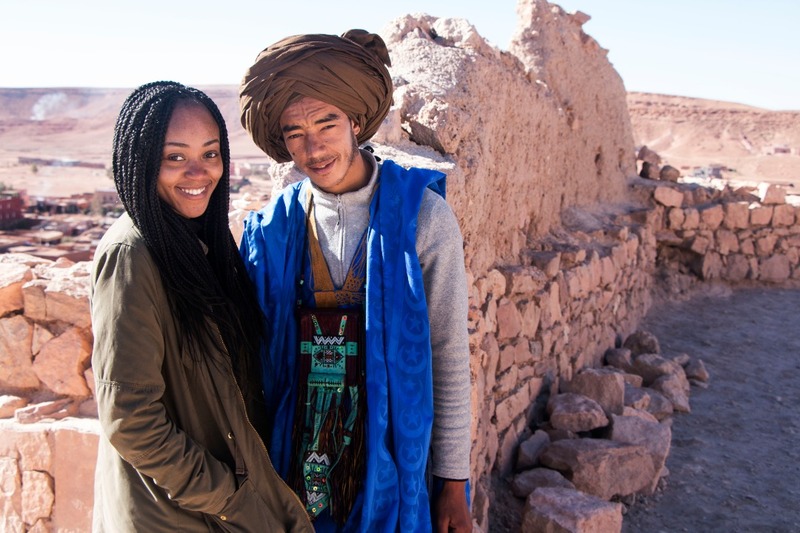 Loved moongazing with Mark and our cat which we christened ‘Anka’, waking up early to watch the sunrise, having breakfast and mint tea next to a fire and loved exploring the Ksar Aït Benhaddou. We began day 5 with a short drive from our hotel to this UNESCO world heritage site. 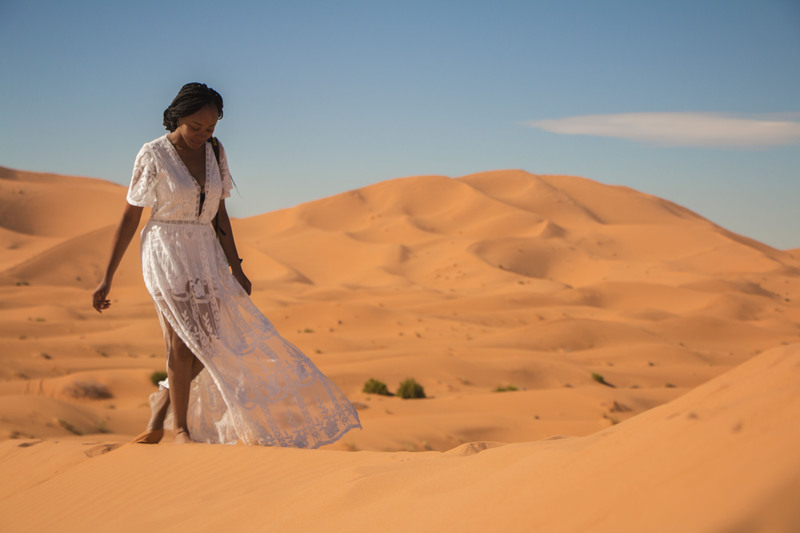 Apart from the very traditional Moroccan architecture and the stunning views we were welcomed to after a short hike, I loved this place because it gave me a chance to rekindle a dream of mine. As you may or may not know, sometime in 2016, I travelled to India to begin a career in the Bollywood industry. That didn’t quite take off so, I was hoping to draw inspiration from this place for a future career in the Hollywood industry. 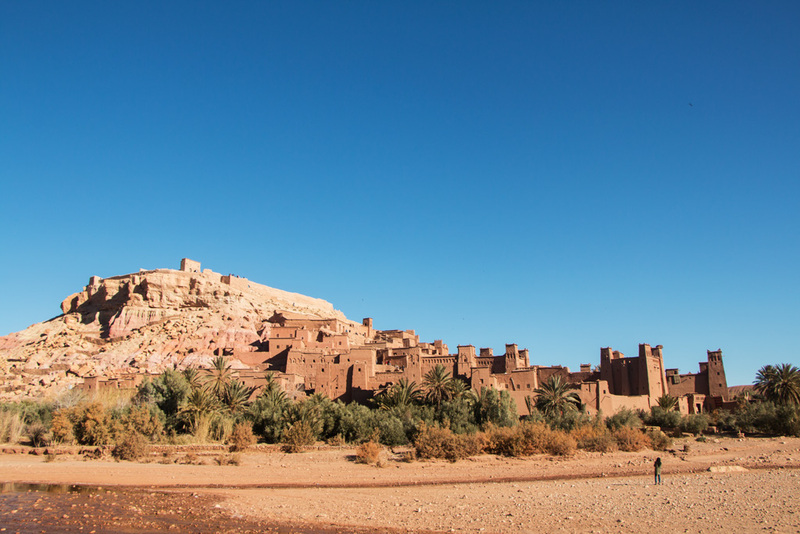 (Aït Benhaddou has featured in many Hollywood movies, including the Gladiator and the Game of Thrones). I think the visit paid off and the result is the short movie below. Magical Morocco (does that look like a heart to you? ): Produced and Directed by Mark H. Starring: Multiple Award-Winning Actress, Amarachi. Anyway, after spending a few hours at the Kasbah, we made our way down to continue our drive to our next stop. We saw this young man on our way out and asked to take a photo with him. If we attempted to do the same in Marrakech, chances are that we would have been charged for it. We ended our drive for the day in Todgha Gorges and checked into our accommodation for the night. This place was a bit rustic but very comfortable. The owners were amazing and dinner was probably the best we had our entire stay in Morocco. Hey look! It’s Tajine on the menu again! It was also a short walk to the gorges, which certainly made our lives easier the next morning. We started the day with a hike up the gorge. It was beautiful to explore but the cold was brutal! I could feel my hands and face grow numb. Mark gave me his scarf to wrap around them and that made the hike bearable. We spent some time here, watched rock climbers around the area for a bit before heading back to our hotel to pack up our stuff and continue our drive. 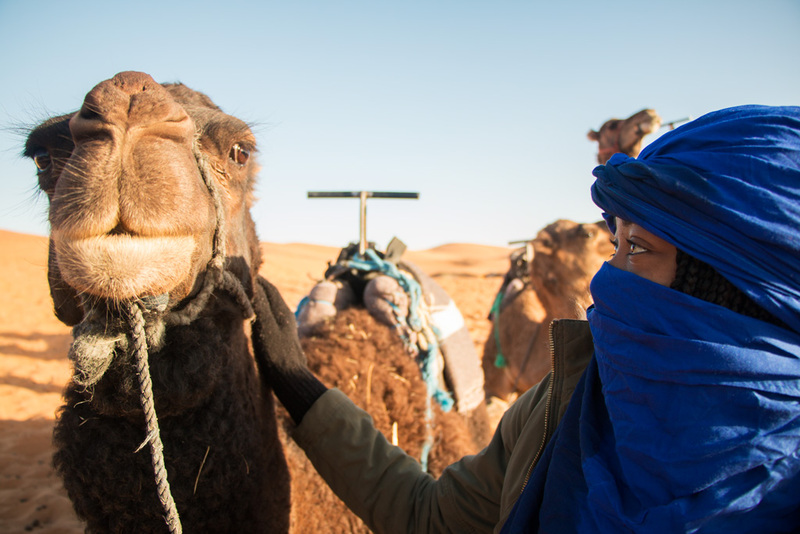 We arrived at Merzouga after a 3-hour drive and met with Omar, a camel trekking tour operator we found online. While planning our desert experience, Mark (and I – OK, I didn’t really do anything) searched for options we could go with. One name kept popping up on a lot of reviews. Omar. We found him, contacted him and arranged our tour for the next few days. Omar was just as the reviews had said he’d be. He was calm, professional and very helpful throughout the duration of the tour. He met us at a gas station just as we got into town and led us to our hotel where he briefed us about the activities for the next day. 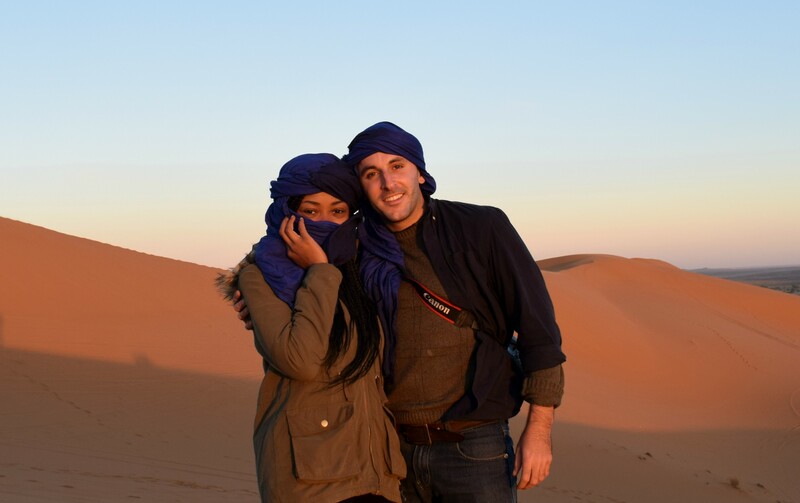 We had a ride in a 4×4 scheduled, a tour of the dunes and an oasis, tea with a Berber Nomad, a lunch stop and a camel trek into the desert later that evening. We returned to the hotel after lunch, got some rest, then went out again for the trek. It took somewhere around 30-45 minutes to get to the first stop. We all got down to watch the sunset here. Then arrived at our camp in another 10 minutes or so. I’m not sure what I was expecting but since this wasn’t advertised as a ‘Luxury Tour’, I was surprised to find our tents fitted with an actual bed and an indoor bath and toilet. Later that evening, we had dinner at a neighboring camp. Then we all gathered around a bonfire to listen to Berber drumming and music to cap the night. The next morning, we rose early to watch the sunrise over the dunes before having breakfast and heading back to the hotel. Omar was there to welcome us and he got us a room to freshen up before we hit the road again. This time to Midelt. 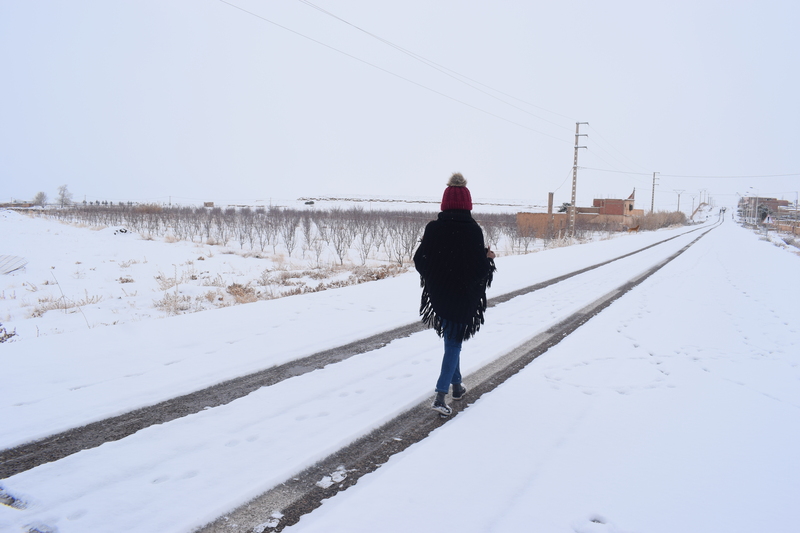 Day 8 & 9: Snowy Days in Midelt, Blocked Roads and More Mint Tea! As we drove into the city, we could see that it had snowed at some point. There was still some left on the ground. Up until this trip, I had never seen it snow before, so you can imagine how excited I was. Mark pulled up the car, giving me a chance to touch and feel it. This was definitely a trip highlight! We arrived at our accommodation by late afternoon. The riad was beautiful and the reception and dining area made me feel like I was on the set of Beauty & The Beast. The next morning, we woke up to a blizzard! I was conflicted between being excited that I was witnessing it snow for the first time or being worried that the roads would get blocked and we wouldn’t be able to get to Fes. We had to return our rental car on this day. We set out of the hotel anyway and followed the tracks a few cars who had gone before had left up behind to a point where we could no longer see them. Then this guy showed up and saved us! We continued our trip and got to another point where the roads were closed. While waiting, the staff around the area invited everyone into a small building to get warmed up beside a fire and to an endless serving of mint tea. Men and women were required to sit in different rooms. 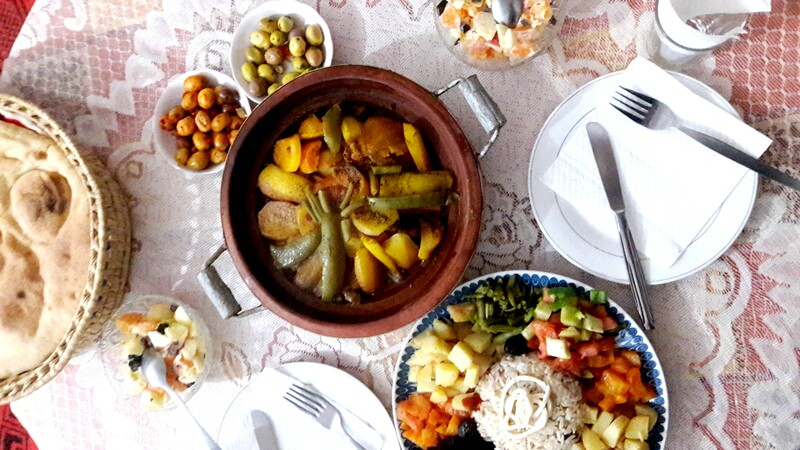 I think this was the best of Moroccan hospitality that we experienced during our stay. The way they worked to keep everyone comfortable, you’d have thought that we were paying for the service. Eventually, the truck came back after an hour. 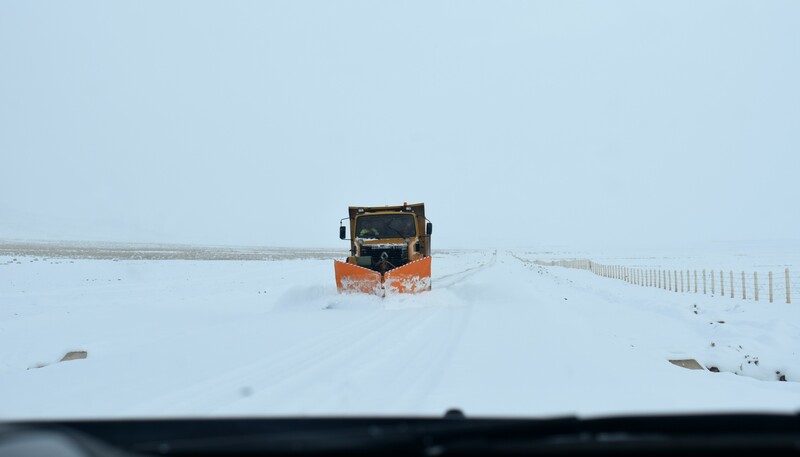 They opened the roads and we were back on the way to Fes! 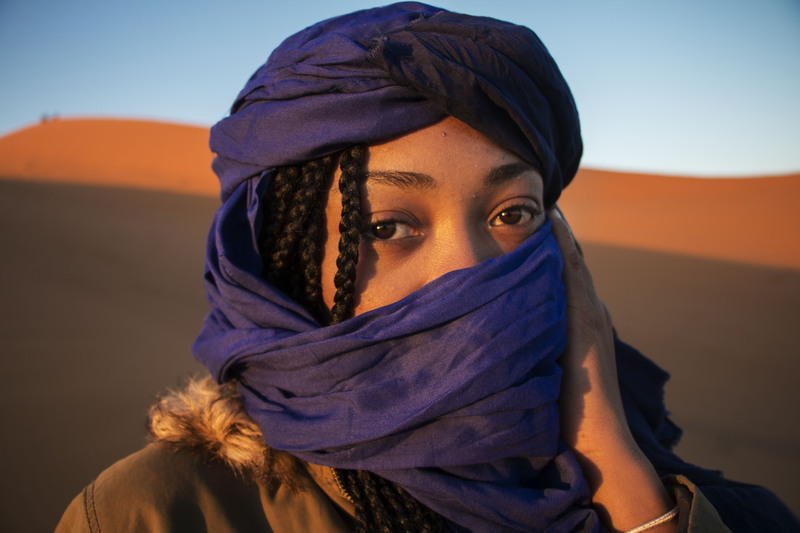 Magical Morocco Travel Diaries: Here's Looking at You, Kid! Sand & snow! Amazing! Love, love, love!!! And you’re now a cat person? Interesting! I have been laughing like crazy since the first article . Girlll!! These pictures! + Give me give me all the mint tea (my second fave kind of tea) I’m curious, do you think you’ll start drinking mint tea back home now, or it was a special experience you’ll keep for Morocco? I love the way you traveled through the country. If I could, I would do this in a heartbeat. 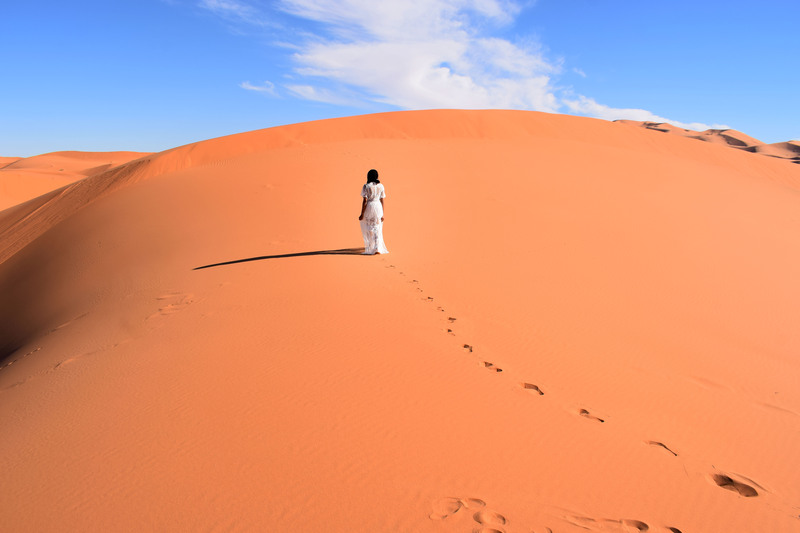 Oh Amarachi…Morocco is calling me!!!! Lol! The snow def was the highlight! I was so shocked when I saw it on your IG page. You need to answer that call! It’s such a beautiful country. Re the snow: There’s always a trade off. 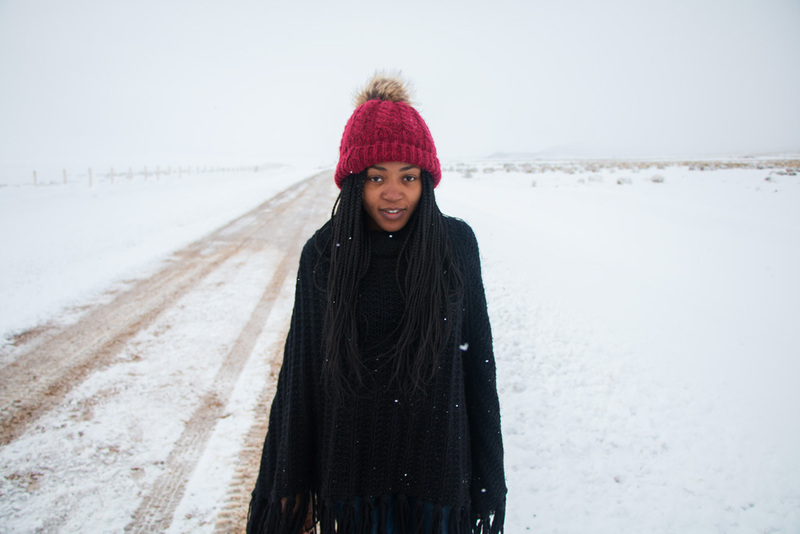 Snow means cold weather for the most part. So, no summer dresses and all of that. Are you sure you don’t want those lying-by-the-pool-bikini-photos? The pictures are so lovely! Oh i really loved the video!! These pictures are so stunning and I really enjoyed watching your vlog!